Two nights ago Justin Timberlake and Jimmy Fallon were guests on Saturday Night Live. As always they were hilarious. 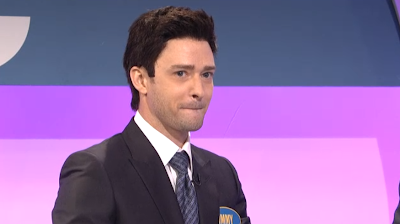 In the images below the "Inward Lip Roll" is displayed twice by Timberlake as he tries to suppress his joy/laughter. Note: Since the writing of this post, the original video has since been deleted from its internet source. The video above contains a segment of the skit discussed - capturing the moment of the first image below, but does not include the second image (which is included for completeness). The inward lip roll (ILR) is seen during the psyche's attempts in suppressing strong emotion (also during some physical acts which require focused concentration). Most often such cases are negative emotions - such as anger, sadness or frustration, etc. 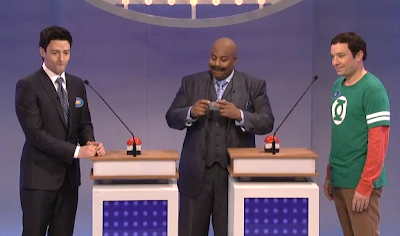 In this Family Feud skit however, Timberlake is having trouble staying in character and is trying to suppress his laughter. This ILR/Body Language example is seen during 2:02 as Timberlake (who is playing Jimmy Fallon in the skit) looks over at the real Fallon who is playing Jim Parsons (The Big Bang Theory). Fallon (Parsons) has completely lost his composure. This ILR nonverbal is seen in the original video (which has since been removed).